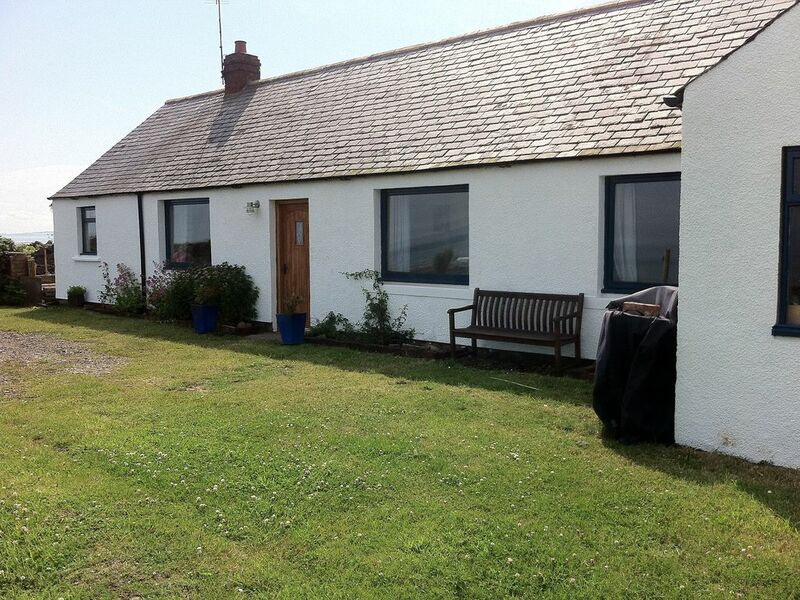 Cottage in St Cyrus, Montrose, Central Scotland - Peaceful Location, Right On The Beach. Seagreens Cottage can be found at the end of quiet road right on the beach. It is a cosy semi detached property which has a large secure garden to the rear and uninterrupted views of the sea. Seagreens is located between the villages of St Cyrus and Johnshaven. It is 7 miles North of Montrose, and 30 miles South of Aberdeen. Ideally situated for walking, fishing and golf and exploring the beautiful surroundings. The cottage has free wifi available for guests to use. There are two bedrooms in the cottage, one double and one twin. There is also space for a travel cot if required. There is a good sized bathroom with a separate shower and bath with a heated towel rail and underfloor heating. The living room has two comfy sofas and a wood burning stove, along with a selection of books, dvds and games. The kitchen is well equipped with a microwave, kettle toaster and a washing machine. There is also a tumble drier out in the side building where the bbq is stored. We have recently installed a hot tub on the patio which is available for guests to use for £30 per visit - this covers the cost of the chemicals and towels. The cottage is surrounded by beautiful coastal scenery, perfect for walking and exploring or simply relaxing. My name is Claire and I have 3 children; 2 who attend the local school and a baby. I do all the day to day running of the cottage, as well as the cleaning which allows me to ensure that everything is up to standard. My husband Ewen also helps out. We live close by and as soon as the cottage came on the market we could see the potential for a holiday let. When we bought Seagreens it was in need of total renovation. We carried this out over the first year starting by painting the outside which made an immediate difference. It is such in such a beautiful spot that I often wish we were living there! The views from Seagreens are beautiful. In the summer there is nothing better than gazing out across the sea, and in the winter when the wind is blowing it is lovely to be cozy by the stove. The cottage is in a great location for lots of outdoor activities, from fishing, walking and cycling from your doorstep to the 90 minute journey to Glenshee for skiing. Well equipped kitchen with everything you need. Numerous pots, pans, frying pans and a casserole dish, a toastie machine and hand blender. If its not there and you would like it please ask! Bright and spacious kitchen with electric cooker and hob, microwave, fridge, freezer, dishwasher, washing machine and large dining table with seating for 6. Fully stocked with a good selection of utensils etc. The book case has a good selection of novels. We are happy to do a book exchange - but please do not leave me with nothing! There is a small selection of toddler puzzles and games. There are 6 golf courses within 20 minutes of the cottage. A 45 minute drive would take you to the famous Trump International Golf Course at Balmedie. There is a hot tub in the garden which is available for £30 per visit. We will provide separate towels for this. Notes on accommodation: The house is heated by electric heaters and the wood burning stove. Outside: To to side and rear of the house there is a large enclosed garden and a patio area with a table and benches for outside dining. There is also a sandpit for children. To the front of the house there is a large area of grass with a washing line. The beach is only 30 metres from the front of the house. There is a small out building that has a gas BBQ for guests to use. There is also a tumble drier in here. Cleaning / Towels / Linen / Maid service: Towels and linen are provided. The cottage is cleaned and prepared for your arrival and linen change provided if you are staying for more than one week. A fabulous modern, cosy cottage with everything provided. The sea view and the hot tub are amazing. Claire is a lovely lady and keeps it spotless. I would highly recommend. We spent three night at this cottage and had a lovely time!!!! The cottage itself was a hidden gem right on the beach front, and very homely, with everything you need for a very comfortable stay!!! The hot tub was amazing after our long beach walks!!! We even tried to book again for the summer while there, but unfortunately it was fully booked!!! A fantastic getaway, and we plan to return!!! Have already recommended to a number of family and friends!!! Thank you so much for your kind review - hopefully we can get you booked in another time! If you want a romantic getaway to gaze at the stars in a warm bubbly hot tub... Look no further. Great weekend in a lovely cottage, which was practical and homely. We had a lovely relaxed weekend at Seagreens Cottage with walks from the front door. The cottage was well equiped throughout and the kitchen a very nice place to cook and eat. The views out the window were great and the wood burning stove made it a cosy place to spend a wet afternoon. Just what we were after, next time we will stay longer. Really lovely cottage right next to the beach. Great for children of all ages. The wood burner and hot tub are fantastic features. We can highly recommend it. Will definitely go back as soon as possible. The cottage is situated on a pebble beach. St Cyrus Beach and Nature Reserve is only a short drive away, you can either park at the Nature Reserve and take a flat walk along the path through the sand dunes or take the road between the school and the church in St Cyrus and walk the steep cliff path down onto the sand. It is a beautiful sandy beach that is rarely busy - well worth a visit. Aberdeen Airport is 35 miles away. A car is essential. There are 3 supermarkets in Montrose and a small post office and shop in St Cyrus. The Anchor Pub in Johnshaven serves excellent food and also offers a takeaway service.